Quick and easy instruction for the impatient student! The electronic keyboard is by far today's most popular way of making music. Recent advances in the development of portable keyboards have resulted in features that are easy to use, sophisticated-sounding, and accessible for novice players. With the aid of this book, even the individual who doesn't know a quarter note from a bank note can have fun with the portable keyboard! The easy-to-follow, four-part instruction takes you from absolute music basics right up through some musical 'tricks of the trade' to dress up your playing style. A comprehensive chord chart is also provided for those who choose to play fingered chords. 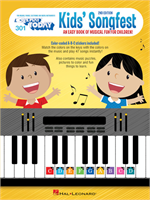 A songbook perfect for students who want to play right away! Features 55 tunes in E-Z PlayÂ® notation that you can play after learning the skills in the Instant Keyboard instruction books. A unique and easy approach to learning to play the piano. Each new music element is explained and illustrated, then applied to well-known melodies. Includes keyboard guide and color-coded keyboard labels. A comprehensive instruction course that includes E-Z Play Today Beginnings A, B, and C plus the Supplementary Songbook. A continuation of Beginnings 1 that introduces more playing techniques for both the right hand and left hand. Teaches right-hand harmony, how to form many more left hand chords and how to play several exciting accompaniment rhythms. This book lets electronic keyboard players in on 'tricks' to enhance their playing techniques. It teaches the player how to add variety and interest to any song by changing registration, adding grace notes, etc.